Sometimes cryoglobulinemia will present with very few symptoms externally, before you have a full-blown flare. I have listed of a few of the more subtle things, and some of the weird things that have happened to me as symptoms some sort of serve as a warning that I am in the early stages of a flare, others only happen when the flare is a big one. You also need to be aware that cryoglobulinemia can affect any organ, and any system in the body. Cryo can affect so many parts of the body, but below are what I believe to be the most common aspects of cryoglobulinemia. Keep these 14 points in mind when tracking your own symptoms. I sometimes get a general feeling of “not well”, but “not sick” days or weeks before a flare. Malaise is a general felling of “not well”. Plus after a week or so of a full-on flare it is very hard to remember what normal is, and everything becomes a struggle. It is hard to be happy when you are as sick as a dog, with no end in sight, and not really knowing what bizarre life-threatening medical event might or might not strike you at any time. You sort of go into survival mode. Don’t confuse this with feeling tired. You might not be tired at all but your muscles are actually weak. This is because people with cryo often experience muscle degeneration, or myopathy in the early stages of a flare and this means weak, sometimes sore muscles. This takes months to heal after cryo is driven into remission. A good combination of rest and exercise helps a bit. Don’t try to push weak injured muscles hard during a flare or you will just pull a muscle and have more pain. Take it easy. General aches and pains, mostly sore muscles…. just kind of achy and nondescript pain for a while before a flare. You simply feel tired. Your body is burning a lot of energy on an runaway immune system You can expect to feel tired. Rapid weight loss. You will lose a lot of weight as the flare progresses. Some of it is due to muscle loss, some is just weight loss in general. 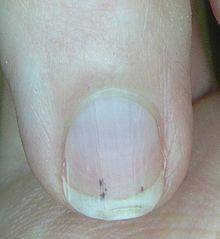 Splinter Lesions under the fingernails are tiny blood-filled lesions under the nail that appear suddenly. They are tiny, long, and thin. They form instantly and it takes months for the nail to grow out enough for them to go away. Fever of unknown origin: You wind up running a fever with no apparent cause. I have had janeway lesions that form right at the corner where the end of the nail meets the skin. These seem to start as a tiny spot that forms suddenly. I generally feel a small, but sharp pain the moment they form due the blood vessels rupturing. Look at the picture above (the white arrow). In my case they usually grow and turn into necrotic lesions as the flare progresses. This results in dry gangrene which takes anywhere from 3-6 months to heal. I have lost the tips of two fingers to these. They start out really tiny… smaller than the head of a pin. Arthralgia is arthritis like symptoms. 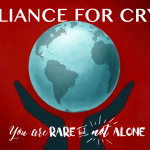 In some cases people with cryo have rheumatoid arthritis as the primary condition, others have symptoms that seem to mimic rheumatoid arthritis, but without the rapid damage to tissues in the joints. Some never experience this. Raynaud’s phenomena, the patriotic symptom: Sudden changes in blood circulation in the hands and/or feet. Sometimes the circulation in my fingers is compromised by the cryo. My fingers may turn white, or blue, and eventually will turn red when the circulation returns. Sometimes the palms of my hands will be a very bright red. Stiff/Achy joints: The RA-like swelling in the joints can cause stiffness and pain. The RA-like symptoms will cause swelling in the joints. Most notably in the ankles, knees , wrist and hands/fingers. Usually the swelling, stiffness, and pain from RA is symmetrical…. that is if the knees are affected, it is typically both knees, not just one, etc. Another interesting thing is that when the joints in the fingers swell , the very last joint toward the end of the finger is always unaffected… no swelling there. Beyond the swelling caused by RA, you have edema, mostly in the lower legs, feet and ankles. This is caused by poor circulation. It can be to the extent that your shoes no longer fit. It does not feel good, and for me, my feet feel rather awful, I am aware of every bone in my feet at this point, and walking is uncomfortable. Massaging the lower legs helps a little, elevating the feet helps a bit. I like to use a heating pad under my feet to keep them warm in an attempt to force cryoglobulins back into solution. it all helps a bit, but the real cure is to get the cryo back into remission. You also need to know that many medications can cause edema in the feet and ankles. Steroids are known for this and it tends to compound the problem. A rash caused by tiny blood vessels rupturing and bleeding in the skin causing tiny ( < 2mm) papules to form. These can come and go rather quickly. This is also caused by bleeding in the skin. It is a close cousin to petetchiae , only the papules are larger… from 2 mm up to about 10 mm (dime sized). See the purpura survival guide in the blog for more info on this. These can be painful and may take weeks to heal. Basically, patches of skin turn black and die. This is “dry gangrene”. It is surprisingly fast, It can be extensive, and can result in very bad things. Small necrotic lesions are sometime misdiagnosed as spider bites. Open sores that won’t heal. The skin dies and breaks down, leaving an open wound. This often requires the services of a wound clinic. Often on the extremities, usually on the feet, between toes, or on the lower legs, but can appear anywhere. Also lesions in the mouth or in the nasal cavity. They can be quite painful; and take a long time to heal, even with proper treatment. This is a really scary looking event when it happens. Basically the veins just under the skin will dilate (usually in response to a change in temperature) . The end result is a sometimes-vivid spider-webbish pattern of purplish veins in the skin. It generally appears on arms, hands, feet, and legs but can sometimes completely cover the torso. It looks really scary, but in terms of cyoglobulinemia, is basically harmless… but is also an indicator that something is going on (namely, cryo). It can come and go in seconds. Sometimes a nice hot shower will make it go away. Mostly in the form of paresthesias (unusual sensations) caused by damage to the nerves in the hands, feet , arms, and lower legs. In some cases the only presenting symptom of cryoglobulinemia is neuropathy. In some cases sufficient damage is done to nerves in the lower legs that people experience “foot drop” (loss of motor control) in one, or both feet. I have had a bout of paralysis and numbness in my right foot ‘that has partially healed, but my neurologist observed that I often drop the toe in my right foot, apparently due to a bit of a foot drop. It sometimes makes me stumble when I walk.